5 of 6 Fastlane main event competitors face off in this go-home edition of SmackDown as Sami Zayn attempts to convince Kevin Owens of his allegiance and AJ Styles aims to protect the purity of his WrestleMania main event against Shinsuke Nakamura. Plus, Charlotte and Ruby Riott exchange words ahead of their title match. 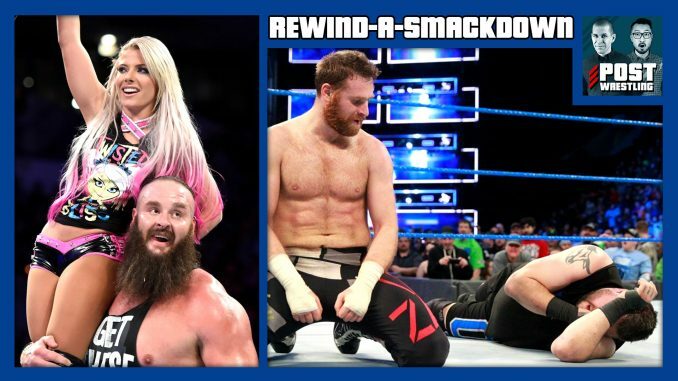 Mixed Match Challenge sees the return of Team Little Big (Alexa Bliss & Braun Strowman) vs. Glowish (Jimmy Uso & Naomi) while 205 Live features Mustafa Ali vs. Buddy Murphy, Drew Gulak vs. Mark Andrews, and the debut of a new tag team featuring Hideo Itami & Akira Tozawa. Plus, Café feedback to the show from the POST Wrestling Forum.